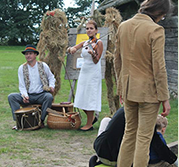 Large amount of the RLS cultural and social life activities take place through the Riga Latvian Society’s commissions and interest groups. The Society has updated the activities of its historical commissions, as well as creates commissions of new courses of action. Right now actively work 10 commissions and People's Living Force’s Research Centre.